We have in for parts our first vehicle at our new location! 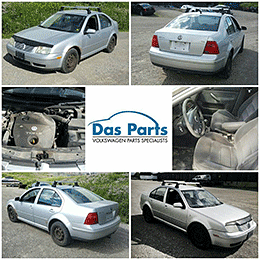 This 2002 Jetta TDI has lots of great parts to offer including a well running engine, a good transmission, and a good turbo. This vehicle also has a set of OEM Mudflaps, and an OEM Roof rack with all keys and accessories. The body has seen some better days, the door and fenders are both rotten, but the hood and trunk, as well as the front bumper are all in great shape. The interior is the same old boring cloth, but this vehicle does have a pristine headliner available.